Marriott Hotels has announced the launch of "VRoom Service" – a first-of-its-kind guest service that allows guests to order inspiring virtual reality experiences to their rooms. Created in collaboration with Samsung Electronics America, "VRoom Service" is a first in the travel industry. The launch represents the latest in a series of innovations by the Marriott International flagship brand that are changing how people travel. Guests are invited to call a dedicated VRoom Service extension or use Marriott's Mobile Request app to request a Samsung Gear VR headset and accompanying headphones. Once they are hand-delivered to the rooms along with easy-to-use instructions, they are available on loan to guests for up to 24-hours. The program is currently being tested for two weeks at the New York Marriott Marquis and London Marriott Park Lane properties. 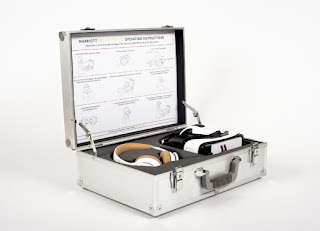 Also launched is Marriott's new virtual travel content platform – "VR Postcards". VR Postcards are intimate and immersive travel stories that users experience in 360 3D via a virtual reality headset. Each story follows a real traveler on a journey to a unique destination; viewers are immersed in the destination and hear the travelers' personal stories about why travel is important to them. The first three VR Postcards were shot in the Andes Mountains in Chile, an ice cream shop in Rwanda and in the bustling streets of Beijing. "Travel expands our minds and helps push our imagination," said Matthew Carroll, vice president, Marriott Hotels. "Our guests want to be in inventive spaces that help foster their creativity and thinking. VRoom combines storytelling with technology, two things that are important to next generation travelers." VR Postcards will be available to guests partaking in VRoom Service at select properties, as well as to the general public via Samsung Milk VR premium video service, accessed via the Samsung Gear VR headset. In addition, Marriott again worked with Framestore's Virtual Reality Studio to develop the technologies and techniques used in creating the VR Postcards experiences. "VRoom Service is one of the first business applications of Samsung's Gear VR technology," said Matt Apfel, Vice President, Strategy and Creative Content at Samsung Media Solutions Center America. "We're tremendously excited to be collaborating with an innovative brand like Marriott on creating the future for travelers." Marriott Hotels has consistently pushed the boundaries of innovation in technology and travel to create spaces and experiences that inspire and foster its guests' best thinking. Last year, the brand introduced the first-ever immersive 4-D virtual reality travel experience with The Marriott Teleporter. In recent months, Marriott delighted travelers with its mobile innovations global roll-out, its industry-pioneering two-way chat feature Mobile Request on the Marriott Mobile App. Its announcement this summer of the first-of-its kind partnership with Netflix changed the future of in-room entertainment. Guests and travel enthusiasts can visit www.travelbrilliantly.com to experience the countless ways Marriott Hotels continues to meet the needs of today's travelers. 0 comments on "Marriott Hotels launches "VRoom Service" - a first ever in-room virtual reality travel experience"